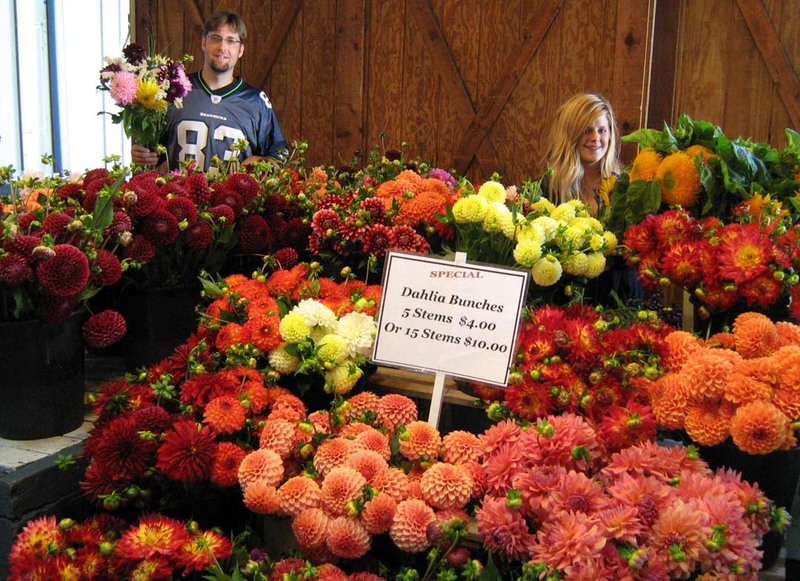 Whether you're looking for fresh produce, cut flowers (dahlia bouquets are fabulous! ), woodcraft or gardening advice, you'll likely find it at your local farmers' market. We talk a lot on this blog about the Olympia Farmers Market, because that's where Lynch Creek Farm has held a booth for years, selling dahlia tubers in the spring, fresh-cut dahlias by the stem and in bouquets (with or without statice, sunflowers and other accents) from midsummer to frost or continual rain, and luscious Christmas wreaths, garland and swags in the late fall. But we're reminded that Lynch Creek Farm got its start at the modest little Shelton Farmers Market, which has also grown since the days when Andy was in grade school and his parents and brothers began growing flowers and veggies for the local market. On a recent Saturday at the Shelton Farmers Market, we found fresh eggs, locally pastured beef, beautiful tomatoes, squash, cucumbers, green veggies of all sorts, organic peaches and cantaloupes, local honey (a phenomenal combination of maple, blackberry and fireweed blossom), bakery products, wood and leather crafts, a group of spinners spinning hand-dyed wool, several food concessions, jewelry, and handmade soaps. A service club was offering free books, and the local Master Gardeners were busy answering questions at their booth. A fiddler was providing great background music and a local goat breeder sat in her goat-cart, driving four mostly cooperative goats to give rides to enthusiastic children. 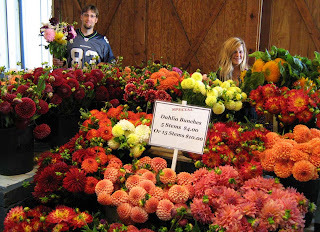 Meanwhile, at the Olympia market, the Lynch Creek gang was selling dahlia bouquets hand over fist, and handing out advice on choosing and raising dahlias to interested gardeners who were thinking ahead to next spring's planting. Conversations abound at the markets, and there's a lot of networking that goes on. Wherever you are, chances are you're not far from a farmers' market. Buying at a farmers' market puts you in touch with your local food sources in a wonderful way, encourages local agriculture and builds community.